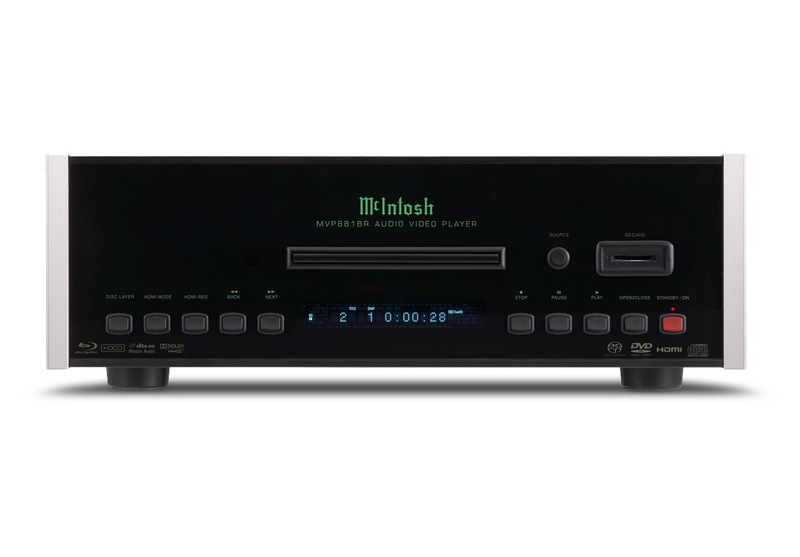 The new McIntosh MVP881 BR Universal A/V Player is a high performance Blu-ray player with web-enabled features that excels at playing SACD and DVD Audio discs as well as standard CD’s and DVD’s. The McIntosh MVP881 BR features custom fabricated steel and aluminum casework with unique, compartmentalized sub structures that inhibit resonance while shielding sensitive audio circuits. Also noteworthy is an all-metal disc mechanism; set in a heavy, damped base, this disc mechanism is quiet running, highly accurate and features a cast-aluminum disc tray. DolbyTrueHD and DTS-HD Master Audio. BD-Live Blu-ray Profile 2.0 web-enabled features. Supports 1080p/24 and 60 frames per second output. Front Panel SD Card Reader.